Over the last four years there have been countless articles discussing melting Arctic ice, almost all of them urging us to "stop global warming." Here is a typical article from National Resources Defense Council ("The Earth's Best Defense"). But note, there is no contention, let alone data, that demonstrates temperatures have been warmer than normal in the Arctic! 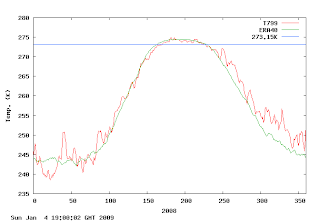 In fact, temperatures have been colder than normal in the Arctic the last three "melt" seasons. You can prove this for yourself here, the Denmark Meteorological Institute. The blue line, 32°F, is the freezing line. 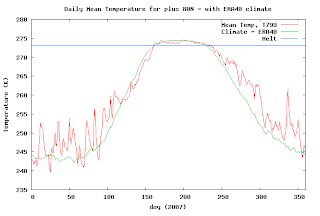 The green line is "average" temperatures. Red is actual temperatures. For most all of the "melt season" temperatures were at or below normal. Shocking, isn't it? You have been told the ice is melting due to "global warming" but that cannot be true based on the actual temperatures. 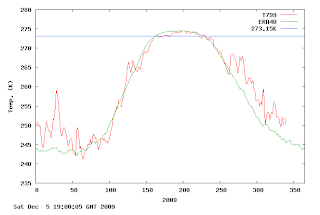 So, if temperatures in the Arctic are not warmer than normal during the melt season, what is causing the ice to melt? The answer is soot pollution, likely from China. This isn't just my theory, there are multiple peer-reviewed paper that have come to the same conclusion. 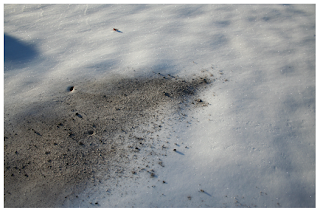 Dark particles on a light snow cover absorb the sun's warmth and turn it to heat, then transfer that heat into the snow, melting it. Let me give you a backyard example. 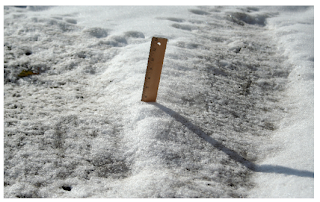 Under clear skies on December 24, 2007, I spread cold fireplace ash in two rows on a seven inch snow cover. 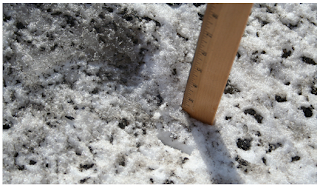 While the soot-covered areas experience must faster snow melt, down to 2.5 inches! It is fine to contend that loss of Arctic ice could have adverse environmental effects. But, the cause of the ice melt isn't "global warming." And, decreasing the amount of carbon dioxide in the atmosphere will do nothing to stop the ice melt if the problem is soot. The same is true with Al Gore's iconic glacier on Kilimanjaro. Oddly, this does not manage to overcome the cooling that happens in Tanzania. The temperature averages actually drop over time. The right most column is the total number of thermometers in that year while the column just to the left of it is the annual average. We start out at 26.7 C and slowly drop to the 23 C range where we substantially stabilize in the 1930s and where we stay to today. The raw data is here. Temperatures have not risen in the vicinity of Kilimanjaro! The more likely reason the glacier is receding is local land use changes including the darkening of the ice cover. Sloppy science (the CRU data) has been used for political purposes to create an ice scare.